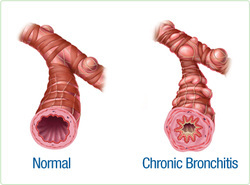 Chronic bronchitis is part of the chronic obstructive pulmonary disease. Chronic bronchitis may present with cyanosis ( blue bloaters), productive cough for 3 months over 2 years, crackles, wheezy and shortness of breath. The common causes of chronic bronchitis are excessive smoking. Chronic bronchitis may present with increase in goblet cells and mucus secretion from hyperplasia of the submucosal gland. The common complications of chronic bronchitis are pneumothorax, respiratory failure , pneumonia and cor pulmonale. The treatments of chronic bronchitis are bronchodilators and smoking cessation.